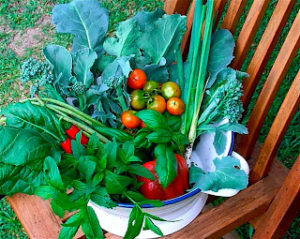 GROW FOOD slow food Have your garden and eat it too. A practical guide to organic gardening in the sub-tropics with step-by-step instructions and delicious seasonal recipes. Come with me too on some of my travels in Australia, Europe, Asia and beyond. These pages have been quiet for the past month or so because I went to a family celebration in Bali and then had a couple of weeks spare so decided, on the spur of the moment, to go to Flores. This is something of our adventures. 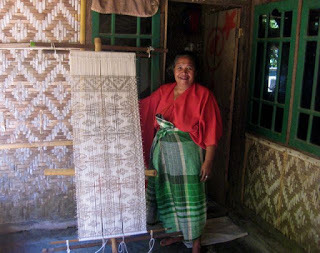 Flores is part of the vast Indonesian archipelago of over 17,000 islands that lies east of Bali between Lombok and Timor, with Sulawesi to the north and Australia to the south. It is a large island – about 700 km long – narrowing to 18 km at it’s slimmest with the Komodo Islands off it’s north-western coast. Its name comes from Portuguese explorers who first travelled along the top of its north coast and marvelled at the spectacular flowering trees dotted among the palm trees and verdant greenery. 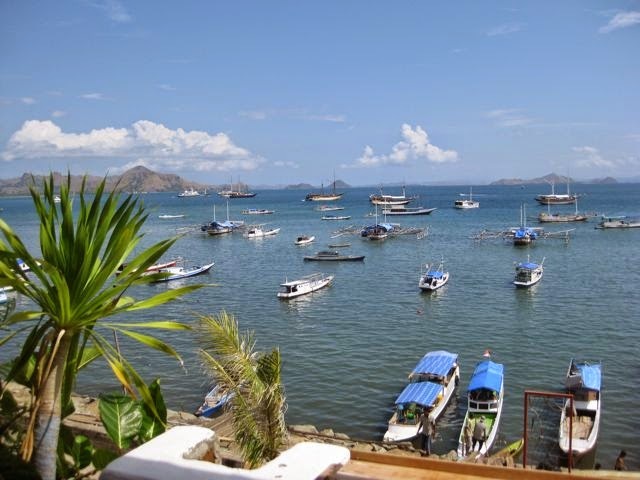 You know when you have arrived in Flores – it feels like the exotic South Seas, east of east, exciting and mysterious – like nowhere else I have ever been before. Flores has long been on the adventurous backpacker route with travel by boat from Lombok – a three day trip – and renowned tumultuous seas where the warm Flores Sea collides with the cooler Sumba Strait. (Our daughter had done this trip 15 years before and she said it was not for the faint hearted). Or, you can take a 1 hour 15 minutes prop. 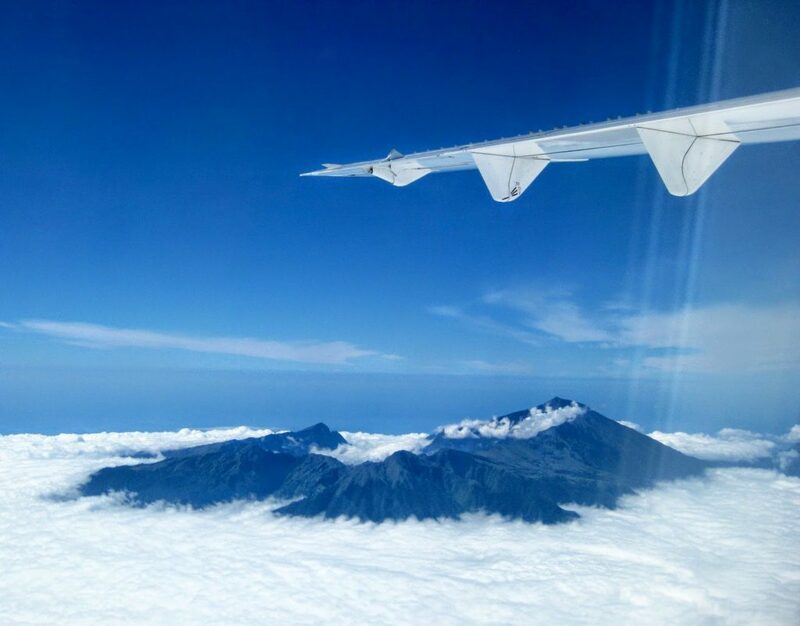 plane from Denpasar, Bali to Labuan Bajo, and fly over some breathtaking scenery on the way (fare on Garuda A$90) – this was the option we took. Not a bad one, as it turned out, because that very same week a tourist boat from Lombok, on its way to Flores, went down in a storm and five people lost their lives. Labuan Bajo, on the western tip of Flores, is the fastest growing region in Indonesia – which is evident when you arrive at the unfinished new and soon to be impressive airport. Despite a clamber over building rubble to the baggage claim, passing an old green shed with a lopsided sign above the door telling you where the VIP Lounge used to be, you just have the sense that this is a place just being discovered by mass tourism – having exhausted Bali. But, for the moment, Labuan Bajo is like stepping into a Graham Greene novel and this old port still has an unhurried, exotic charm about it. The picturesque harbour is dotted with traditional wooden boats called phinisi – in fact, we didn’t spot one ‘plastic’ boat or a touristy shop selling touristy things – they are probably there, but I wasn’t looking that hard. 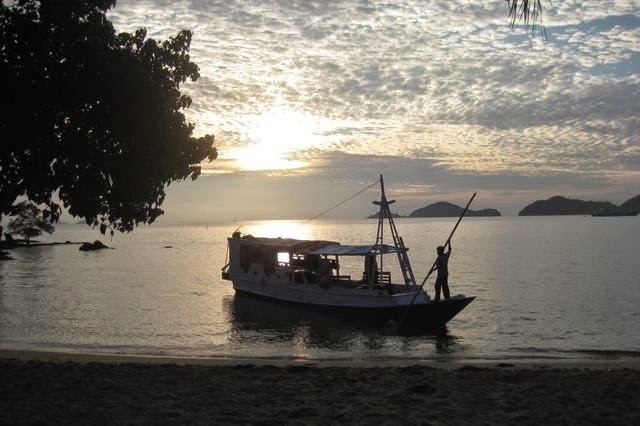 What you will find are lots of dive shops and tourist agencies, for Labuan Bajo is the gateway to the World Heritage listed Komodo Islands with it’s exotic fauna, flora, magnificent coral reefs, tropical fish, dolphins, turtles and whales. 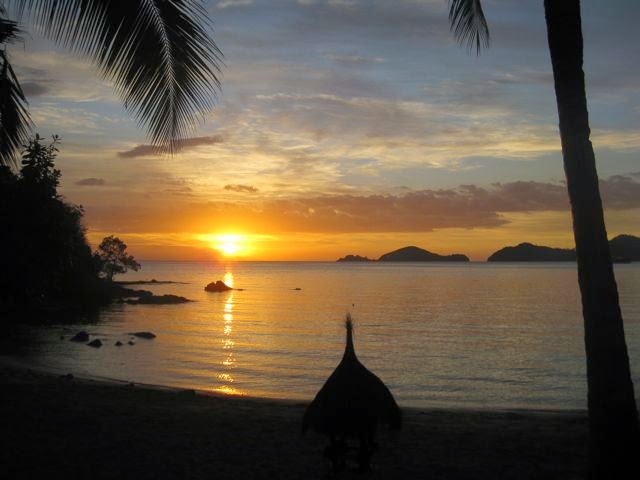 In fact, most visitors to Flores come here just for that experience and never venture any further afield. And, while the Komodo Islands have been listed as one of the Seven Natural Wonders of the World and they are certainly worth a visit, Flores has just so much more to offer the adventurous traveller with a week or more to spare.Labuan Bajo is also the jumping off point for the burgeoning luxury sea cruises to the exotic Spice Islands of Ambon and Banda – the true Eat Indies and reason why the early trade routes opened up here – they were after their nutmeg, cloves and cinnamon. Why did Labuan Bajo feel like stepping into a Greene novel? Apart from the ramshackled South Seas charm of the place, there was a certain excitement and tension in the air. This, I suspect, was due in part to it being the end of ramadan with 20 million people on the move across Indonesia for the traditional trip home for Idul Fitri. This Islamic three day public holiday on Flores had the full festival feeling with street parades, fireworks and feasting which was in total contrast to the 85% of people in Flores who are Roman Catholic with churches, priests and nuns a regular sight on the streets and virtually ignoring the whole proceedings – doing the usual thing like Jews at Christmas – making the most of it. 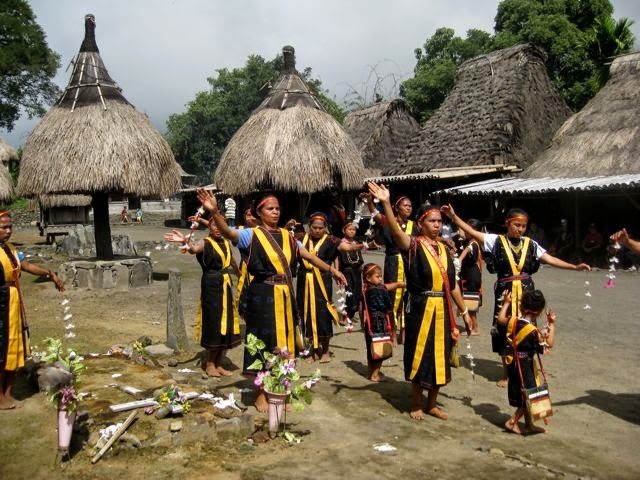 (The Portuguese arrived in Flores in the 1600’s and converted most of the population to Catholicism but ancient animistic beliefs (adar) are still alive and dancing among the Catholic population – but more of that later). 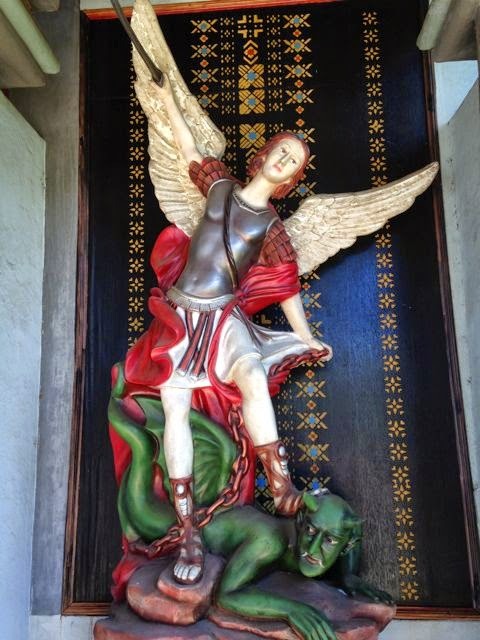 St George slaying the dragon/devil outside St Josef’s church near Ende with a unique Floresian touch of using a typical textile pattern as the background motif. What added to the tension was that our visit also coincided with the long awaited announcement of the result of the Indonesian presidential elections between the old guard Prabowo, and the new kid Jokowi. I was told that over 80% of Floresians voted for Jokowi (he had personally promised to fix the roads!) and the announcement of his success came with a great deal of excitement, relief and optimism for the future. After we saw some of the roads we could see how the promise to fix them could be a vote winner! “As a Muslim majority country, which also has a robust and vibrant democracy, Indonesia is quite exceptional in a Muslim world dominated by monarchies, dictatorships and uncertain, vulnerable democracies. Komodo Islands It was not that hard to organise a trip out to Komodo from Labuan Bajo on a traditional boat for two days and a night – you just take a wander down into the port area. We were tossing up whether to go for two nights when the friendly tour operator said “I think one night will be enough for Ibu” – how right he was! While I loved most of it – trying to sleep on the deck above the engine housing with little head clearance, which meant crawling to the toilet at the back of the boat, was not really my thing. I had also imagined a romantic night under the stars bobbing about in a balmy tropical cove, not factoring in that our captain, Mahkmoor, had made a beeline for a particular sandy cove – the famous Pink Beach – for one reason and one reason only. Also moored there was a tramp steamer from Lombok full of scantily clad backpackers. I could see Mahkmoor losing all interest in our needs as lovely things in bikinis leapt onto the beach followed by chaps with cold cases of beer. A soccer match started, then a bonfire and barbeque, then a riotous party. All scruples, religious or otherwise, were cast aside and Mahkmoor joined them, finally wading back to our boat at 3am gloriously and noisily drunk – then, at 4am the call to prayer started from Lombok village – yes, one night was enough for Ibu. Whilst I was furious at our captain’s shenanigans Michael, who had slept through most of it, just said – well you would, wouldn’t you? Apart from that – we had a fantastic time. 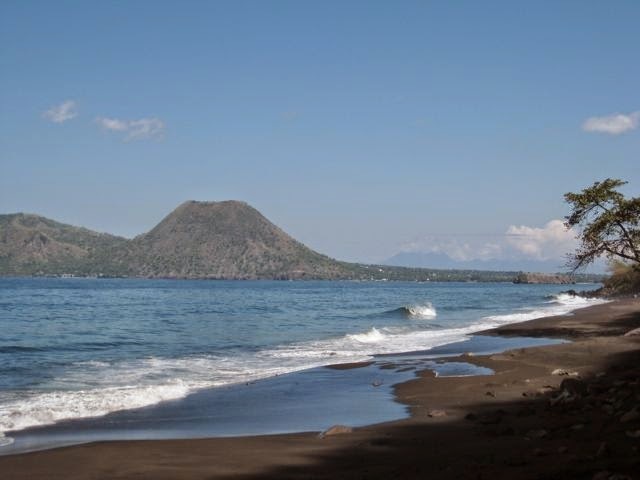 When you travel from Bali to Lombok you cross the Wallace Line – named after naturalist Alfred Russel Wallace, a contemporary of Charles Darwin (and first to expound the theory of evolution). His many trips to this region, in the middle of the nineteenth century, lead him to the conclusion that islands to the west of the line, including Bali and Java, were once part of the vast land mass of Asia, and everywhere to the east, from Lombok onwards were once part of the Pacific-Australasian continent (Gondwana). This conclusion was based on his observations of the species of flora and fauna that were quite distinctly and uniquely existing either west or east of the Line. So, when we stepped onto Komodo I was looking at flora (cycads and acacias for example) that was very similar to a dry Australian landscape and nothing like I had ever seen in Bali. But, there were more surprises. 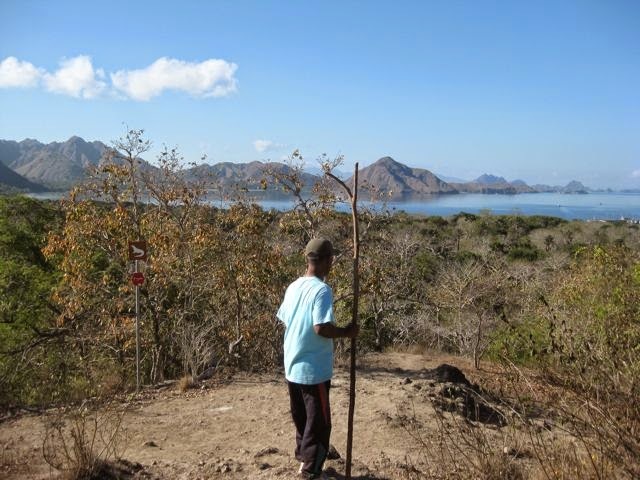 We had a fantastic guide from the local Komodo Village – but for once I hadn’t brought a notebook or pen with me – his knowledge about the traditional use of many of the plants was wonderful. We chose to go on an hour’s trek up Sulphurae Hill – we thought named after some sort of sulphur springs common all over Indonesia. But no – we very quickly heard a familiar bird call (like a squeaky door) of the Sulphur Crested Cockatoo and then the equally raucous Noisy Friarbird. We were very quickly surrounded by a swarm of very hot and perspiring bird-watchers with small binoculars, large cameras and action pants (you know, the kind that zip-off at the knees), very excited at spotting these two ‘rare’ birds. We had a smile and told our guide that those pesky things woke us up every morning being regular visitors to our garden in Australia. We are brother and sister, I said in my halting Indonesian; which got a large smile from our lovely guide. Komodo Dragons There are about 6,000 of them living only on three islands in this region – the largest group and size of them on Komodo – getting up to 3m long. Whilst their normal diet is deer, pigs, water buffalo and smaller dragons they have been known to attack and kill humans too so you need a guide wherever you go. 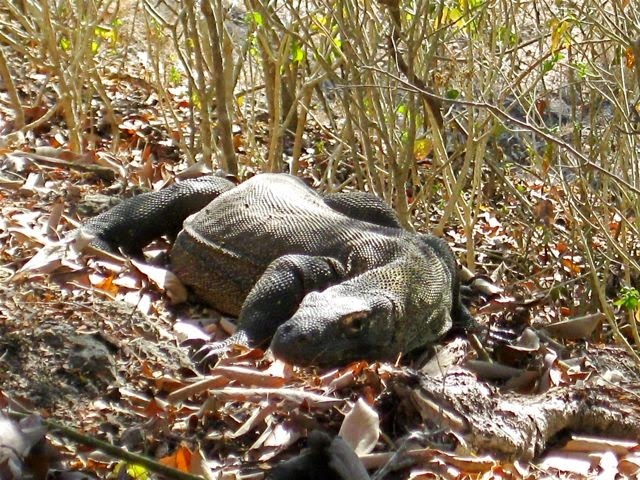 The dragons (monitors) were being quite shy on our visit as it was the mating season, but our guide managed to help us spot a couple of them basking in the sunshine – perhaps hoping to catch off guard the odd lagging-behind birdwatcher? The rest of the time on our little boat we spent snorkelling, eating and sleeping. In fact the second mate, Jumadi, cooked up the most delicious local food that we ate on Flores. I really don’t know how he did it in his tiny little galley kitchen. Lunch anyone – mie goreng (fried noodles with lots of vegies decorated with curls of omelette), ayam goreng (spiced fried chicken) ikan sambal (fresh fish in a tomato, onion, garlic, chilli sauce) with local rice (which has a red or pinkish colour). For afternoon tea he rustled up pisang goreng (bananas fried in crispy batter) or banana and coconut pancakes with palm sugar syrup. So, while we may have been sleep deprived, we did not go hungry. 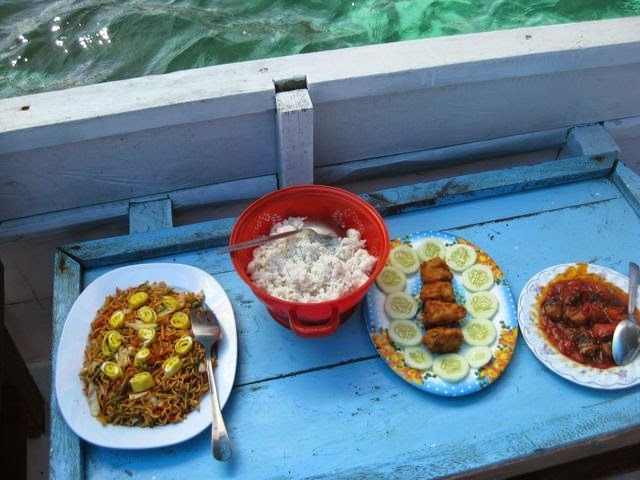 We were moored in a small crystal clear cove, about to tuck into this feast, when a canoe from the local village pulled up and asked us if we would like a cold Bintang beer – I now have some understanding of how Baden-Powell felt when Mafeking was relieved. Labuan Bajo to Bajawa The next part of our adventure was a road trip across Flores with a first days long drive via Ruteng to mountainous central Flores. We had found it very difficult to organise this or, in fact, work out where we wanted to go, what to see and how to get there for we could not find one map or any guide books for sale anywhere. Our hotel in Labuan Bajo, who were useless in this department – had directed us to the Tourist Information Office – the existence of which was unknown to our taxi driver who, with a stab in the dark, took us to the most official building he could think of; which turned out to be the ante-natal clinic. Bemused, they directed us to a dilapidated government bungalow down the road that contained two men having a siesta on the floor(Catholicism is not the only thing the Portuguese left behind) and a lifelike plaster model of a komodo dragon with large bits missing.This then was the Tourist Information Office of Flores that had no maps or guides – not one – “sudah habis” – already finished, the sleepy men said. Regardless, armed with an ancient map book of Indonesia, that we had brought with us from home, we organised a driver and car and took off anyway – Agus (Agustinos) had come recommended and seemed to know where to go – he spoke good English and fortunately we were to discover that we shared similar tastes in road trip music. A note of caution. Make sure the car that they show you (great, modern 4×4 with air-con) is the car you actually get and not what we ended up with (old bone shaker with wind-down windows that ultimately broke down). 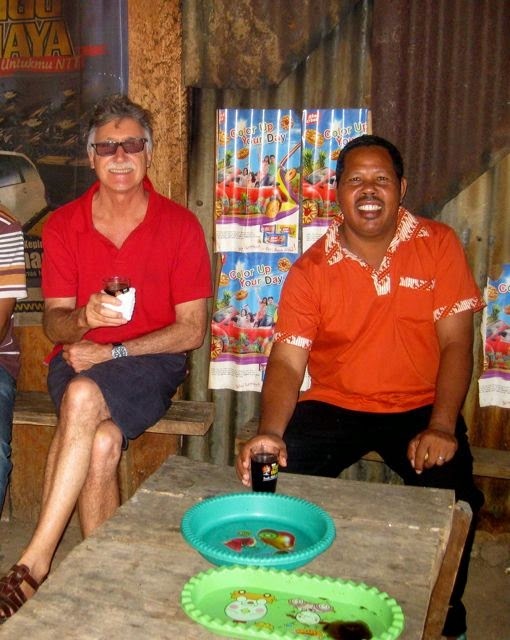 Ruteng to Bajawa:I had read about the trans-Flores highway. 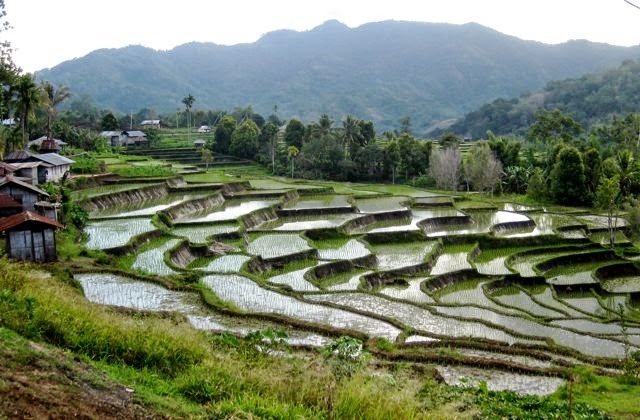 Forget it – it doesn’t exist – or else it is under construction and the roads are atrocious but, the scenery is magnificent – through dense and lush rainforests, towering stands of bamboo and emerald green rice fields. 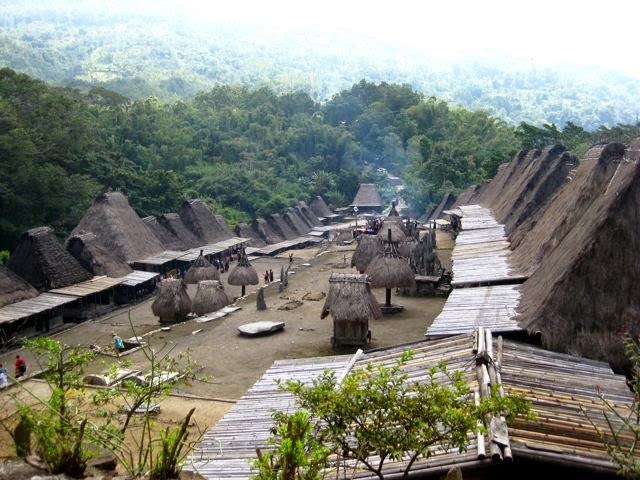 If we had done our homework properly we would have pre-organised a few days trek around Ruteng, visiting Wae Rebo (one of this region’s remote traditional villages) and Liang Bua (where the remains of the Flores ‘hobbit’ were famously found in 2003). As it was we were just passing through, only stopping at Agus’s sister-in-law’s house to pick up a pot and some potatoes! Michael’s eyes lit up briefly when Agus asked us if we would like to sleep with the ‘virgin women’ in Ruteng on the way back, which quickly faded when he realised that Agus meant at the local convent with the nuns! 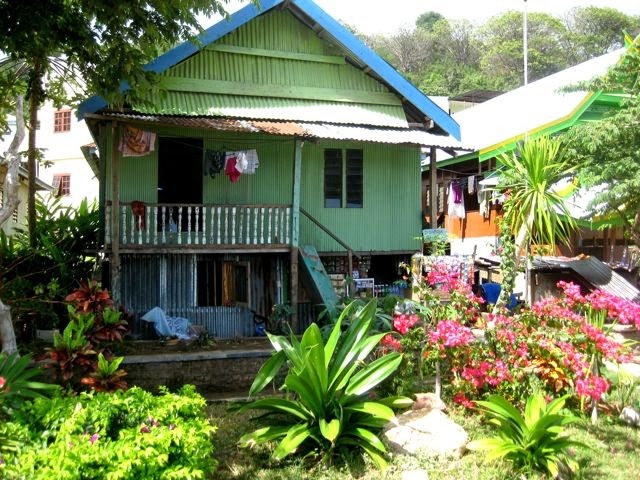 TIP: It’s possible to stay at many convents around Flores (pre-book) and a good option for women travelers. Flores has fabulous coffee and Agus knew of all the best coffee shops on the way. We were on the road with thousands of other travelers going home for the end of ramadan and the Idul Fitri celebrations. Buses and minivans were packed with people and baggage, some with chickens tied to the back and often young men deciding to avoid the cramped and hot conditions inside by precariously sitting on the roof. We had one close shave; on coming to an abrupt halt, coconuts began cascading from the roof of the bus in front of us narrowly missing our windscreen. Disaster for us was avoided when passengers from the bus suddenly leapt out and chased the rolling coconuts down the hill. All along the edge of these twisted roads are large plastic sheets spread with drying crops of rice, coffee, cloves and cocoa, marked by large rocks in the hope that the trucks and buses won’t drive over them. 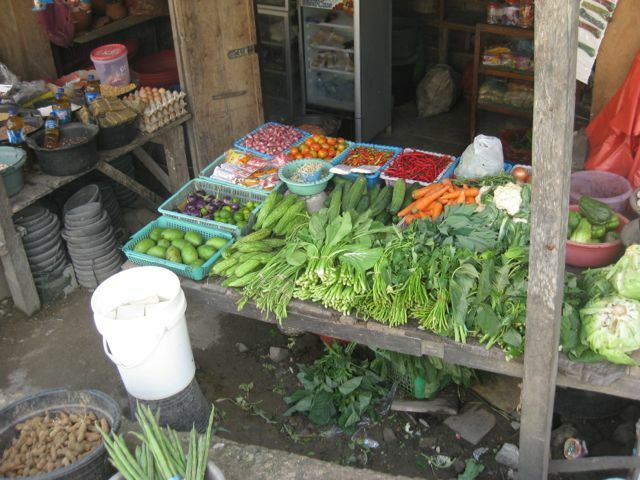 There is also no shortage of fresh fruit and vegetables produced in this incredibly fertile volcanic soil. Argus was always stopping to buy whatever was the regional speciality – large yellow passionfruit, sweet oranges, roasted corn, peanuts etc. We finally arrived at our destination of Bajawa after a bone-shaking nine hour trip. It was cold and I was very glad that I had a jacket and long pants, that I ended up sleeping in for it got even colder – we were 1,100m high with the town framed by a perfectly formed volcano Gunung Inerie and in the center of the Ngada region. 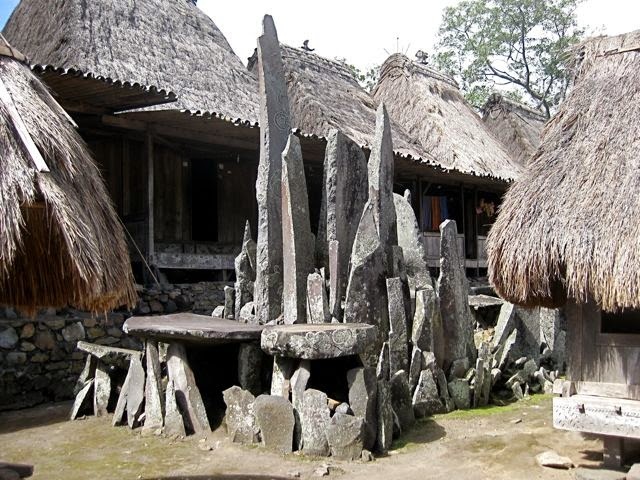 There are five distinct peoples and languages on Flores dictated hitorically by the rugged and isolating terrain. Although the locals understand bahasa Indonesian they speak their own local languages amongst themselves and Agus couldn’t understand the Bejawans, being from Manggarai in the west; he spent most of the time just scratching his head. You don’t ask much from a hotel – clean and comfortable bed, functional and clean bathroom. Unfortunately the Hotel Bintang Wisata in Bajawa provided none of these. Fortunately we had a duty-free bottle of Gordon’s gin and an interesting couple of fellow disgruntled guests to share it with. The best was yet to come. Agus met us at breakfast (sweet white bread with an egg – standard fare – get used to it) with the news that there was a festival in the village that we were going to visit that day, to celebrate the completion of a new house. Bena is one of the most traditional Ngada villages nestling under the dome of Inerie with a spectacular layout – like a ship – with thatched houses strung out around a central square – dropping a level in the middle, the deck. The central earth square was lined with megalithic tomb like structures – some of them dating from the stone-age. It was also lined with the villagers making music with drums and gongs and dancing – whilst the biggest wok I have ever seen was bubbling away with discernible bits of recently slaughtered pig poking out (lunch). The dancing – shuffling really – periodically started up, went on for a few minutes, petered out only to start up again a few minutes later. This was to go on for the next 24 hours while the village filled up with returning relatives bearing the traditional gifts of a live pig, bottle of arak (local liquor) and a packet of cigarettes. Agus assured me that these were ‘Catholic people like him’! The next day they were going to slaughter a buffalo and have it for lunch along with the gifted pigs. We spent a few hours here and it was great because we were largely ignored by the locals. They offered us coffee in the shade of one of the families’ verandahs and, even though we were, we were not made to feel like voyeuristic tourists. TIP Agus had asked us if we wanted to visit the hot springs close-by. We declined, thinking they were like the numerous hot springs we had visited before in Indonesia – sulphurous, smelly, bubbling mud pools – silly us. Our gin drinking buddies told us later that they were wonderful – situated where two rivers met, one hot and one cold, and you could swim in them! Bajawa to Moni We were on our way to Kelimutu National Park through more spectacular scenery to be based for a couple of days in the rural village of Moni – surrounded by rice fields, rushing rivers and soaring volcanic peaks. We had a very peaceful nights sleep at the new Ecolodge – about 1km out of town – resisting Agus’s suggestion to stay at another one of his mates’ places – cheap but not cheerful! 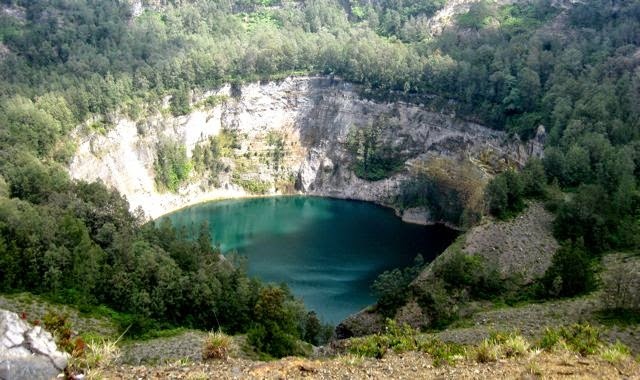 The traditional thing for visitors to Kelimutu (1,639m) is to get up about 4am and climb to the top for sunrise and observe the changing colours of the three famous lakes. We were wisely told by other travellers not to bother as it was normally shrouded in cloud until about 10am – when the mist briefly lifted and you could see the three famous coloured crater lakes. With this sound advice we had a delicious lie-in and lazy breakfast smugly passing glum hikers on their way down from the mountain, at 9.30am, that was still shrouded in fog and raining. We were in for more Gondwanic surprises. 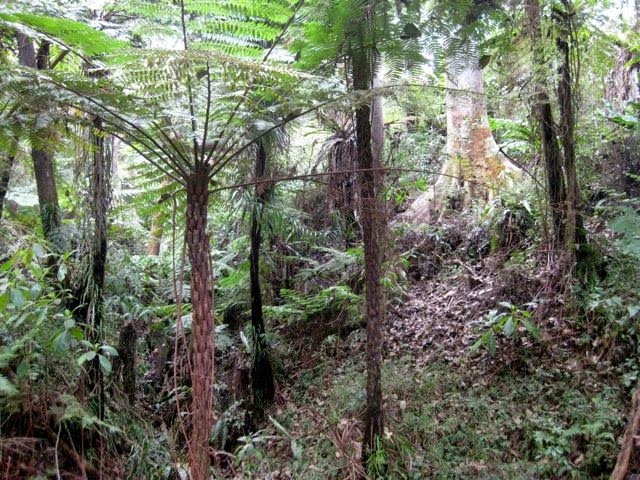 The dominant tree species all the way up the mountain was Casuarina equisitifolia, commonly known in Australia as she-oak, and as we climbed higher we entered into rainforest that was just like being in the back of Mullumbimby, where I live on the sub-tropical east coast of Australia ,- with almost identical flora. Casuarinas look a lot like straggly conifers. Agus had a song for every occasion – a man after my own heart – (he’d see goats, bananas, bamboo and know a local song about it) At the first sight of the casuarinas he immediately broke into a rendition of “Oh, Christmas Tree, Oh, Christmas Tree” followed by a traditional Manggarai folk song about these trees telling us that Floresians used them for their Christmas celebrations. But we couldn’t top his version of “It’s a Long Way to Tipperary” although we did join in with the chorus. 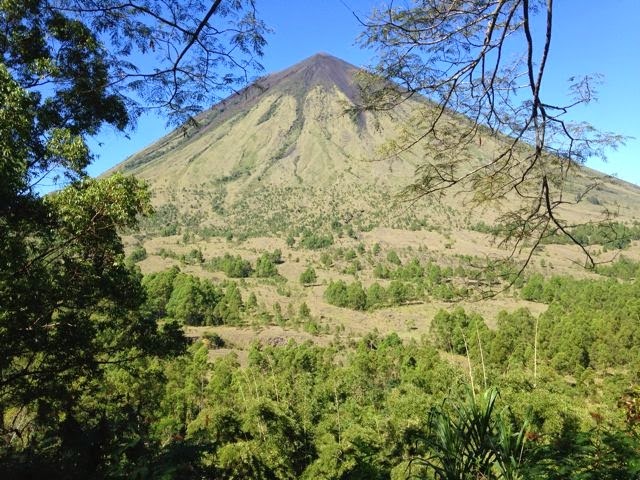 Kelimuti is sacred to local people – they believe it is the final resting place for the soul and many make an annual pilgrimages to the top of this blown-out volcano to leave offerings on ancient stone slabs. It’s an eerie place where the rainforest vegetation drops away to scattered scrub dominated by three mighty craters that contain the coloured lakes. We were in luck. By the time we arrived at the top the clouds had lifted and the sun came out with the three lakes, affected by volcanic gasses, appearing as bright turquoise, black and emerald green – a truly amazing sight. Within twenty minutes the clouds closed in again and all colour was gone from the lakes. (When my daughter was there 15 years before, she said that they were blue, brown and red! )TIP It’s well worth taking the side path, about halfway back to the carpark, along the track marked ‘arboretum’ where all the significant trees and vegetation are labelled. If we had more time I would definitely have take the option of a longer trek through the forests around Kelimutu – the landscape and vegetation made me want to see more. Ending up in Ende Unfortunately, this was where our trip was cut short by the lack of shock absorbers in Agus’s jeep and my dodgy back, so we didn’t make it to Maumere on the north coast for more snorkelling and beach bungalowing – instead deciding to fly back to Labuan Bajo from Ende (A$40 on Garuda) where we had a connecting flight to Bali. I had wanted to visit some of the villages around Ende that still produce traditional textiles with plant dyes – so all was not lost. 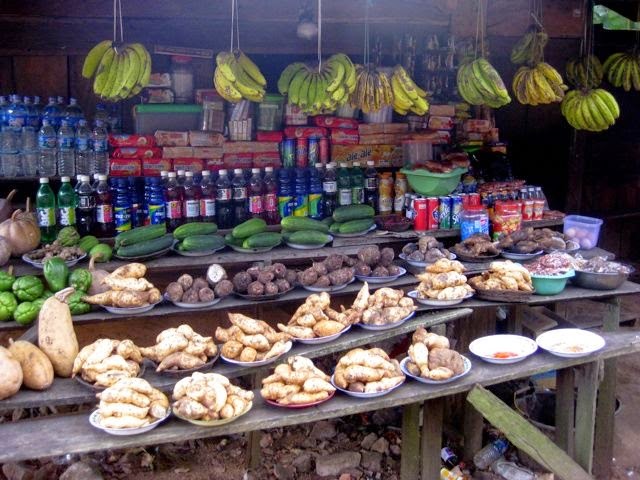 Apart from that, there is not a lot of charm to be found in Ende – it’s mainly a transport hub. The coastline, while quite picturesque, is not really inviting with pounding surf and black sand – the white sandy beaches being all on the north coast. We tried to find some charm in Ende and ventured out to see ‘the sights’, but the Sukarno museum was tutup for renovasi and the fish market restaurants were habis for ramadan. (Ex president Sukarno was exiled here by the Dutch to keep him out of their hair) We had chose the Grand Wisata Hotel because it had a pool – for Ibu’s back, but it was the strangest designed hotel I have ever stayed in with cavernous tiled lobbies, stairwells and corridors, but tiny dungeon like rooms. Things were tight, because of the public holiday so we took what we could get, but one night in an incredibly noisy windowless cell in the basement had us pleading with the front desk at 6 o’clock in the morning for something, anything, else – no matter what it cost. We were then told that the Presidential Suite was available for only $10 more!! We took it sight unseen – it couldn’t be worse after all?!!. I don’t think any president would stay there but we couldn’t have been more happy with this turn of events – just getting to it was a bit of a mission. It was right at the top of the hotel – through the darkened ballroom (which always had a member of staff stretched out across a couple of plush chairs with mobile phones glowing in the dark – it was the only place in the hotel with reception), across an unfinished roof and finally up a fire escape. But, it was very peaceful and it had a bath – and all for $50 per night with breakfast!. A comment from a fellow Aussie guest we thought most apt “I reckon the bloke who designed this hotel must have been smoking the cheap stuff”. 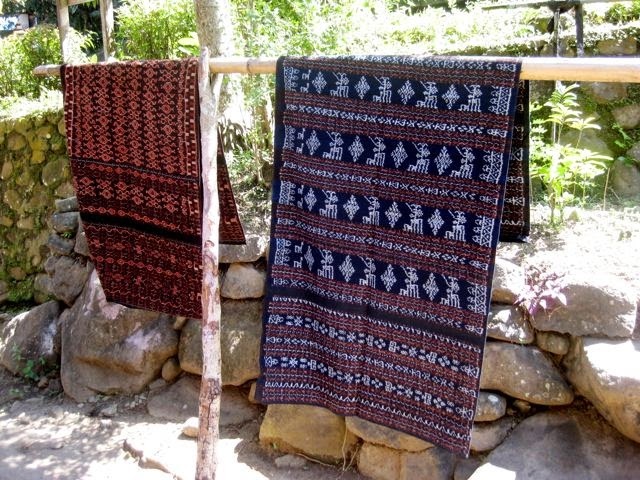 Traditional Flores textiles at Bou Sama Sama foundation, Ndona near Ende, with indigo used for blue dye and morinda root for red. You can take workshops here. Returning to the Bintang Flores Hotel in Labuan Bajo was like coming home and guess who drove through the night so he could pick us up at the airport? TIP Made in Italy. Labuan Bajo surprisingly has one of the best Italian restaurants I have ever eaten in with chef Marco Bertini having a real presence, welcoming guests and sending over complimentary limoncello – that always goes down well. He is also doing a fantastic job of recruiting locals for staff and growing much of the produce on his own nearby farm. We don’t normally eat Western type food in Indonesia but after a week of pretty ordinary tucker (a lot of the local places closed for ramadan) we were really looking forward to a return visit to this restaurant. In fact, I was dreaming of his homemade sourdough bread and salad of tomatoes and ricotta – also homemade. The squid ink ravioli stuffed with clams was pretty damn good too. It’s like an oasis. Next time Banda and Aceh – Flores was fascinating and fun. 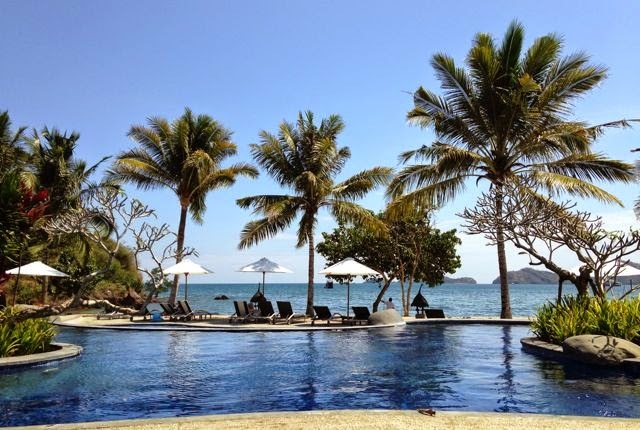 thanks so much for sending me your blog of your trip to Flores. really interesting. I am reading at the moment Spice Islands by Ian Burnet – a history of the early explorers to the Spice islands. Actually Antonio de Abreu and his 2 ships reached Banda in 1512 after sailing past Flores and calling it Cabo de Flores because of the red flamboyant trees growing there. Toni Pollard lent me the book but it's so good I think I will buy a copy to keep. She also lent me Mirah of Banda which is also good. I tried to post a comment on your blog about these books but I don't think it was successful. Would you love a kitchen garden but don’t know where to start? Let my experience and expertise guide you to success? Soil testing, site analysis, fruit trees, fertilizing, non-toxic pest control, composting – this is my world – come and join me. A one hour onsite consultation will often answer all your questions and help you on your way to the joy of year-round healthy food from your own garden. How much are you really paying for your electricity? How Much Space Do You Need to Feed Yourself? Diane Hart on Soil Nutrition: When, How and What to Feed the Soil? Blake on Soil Nutrition: When, How and What to Feed the Soil? Copyright Diane Hart 2011-2017 All rights reserved..